Why Aren't Americans Saving for Retirement? Financial experts have been warning for years about the importance of saving for retirement. The news is filled with stories about seniors returning to work or delaying retirement because they don’t have enough in savings and can’t survive on Social Security alone. Despite these warnings, surveys show that a staggering number of households still have little or nothing saved for when they leave the work force. So why aren’t Americans saving for retirement? The latest surveys reveal the barriers that make saving difficult, along with easy ways to save money for retirement that anyone can use. 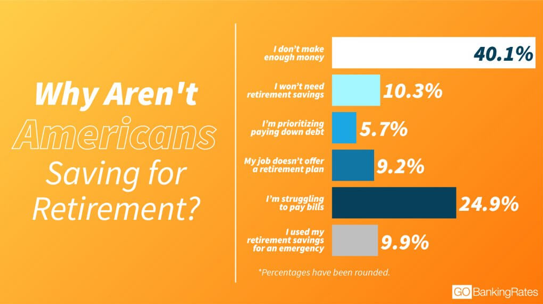 According to a 2018 Go Banking Rates Retirement Savings survey, not making enough money was cited by 40 percent of respondents as their reason for not saving for retirement. Struggling to pay bills was the main barrier for nearly 30 percent of those surveyed. A recent survey by PurePoint Financial presents a more nuanced view, discovering that poor savings habits and lack of financial knowledge also play a role. One of the barriers to building up retirement funds is lack of financial knowledge that leads to poor saving decisions, according to the 2018 survey by PurePoint Financial. It found that just 52 percent of Americans have money saved in a retirement account. Of those that saved, 73 percent of those surveyed were not actively seeking the best rates or places to save their money. Nearly half of respondents simply chose the same institution where they had their checking account, and 4 in 10 believed that their checking and savings account have the same interest rate. Since the average rate of return is significantly higher for investments, making this money mistake could cause the accounts to have thousands less by the time the owners reach retirement. A big barrier to saving for retirement is believing you need to save a lot to make the effort worthwhile. If you’ve been waiting because you wonder, “do I have enough money to invest,” you could be missing out on years of interest. Instead, you can start by saving for retirement in little ways. 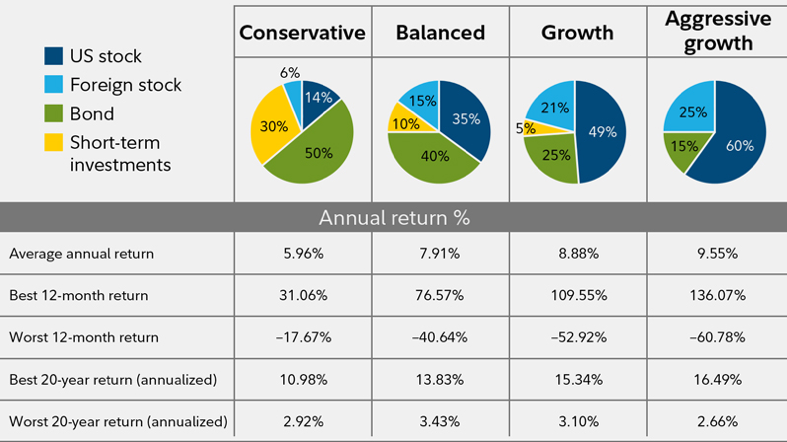 Begin by investing as little as 1% of your salary in your employer’s retirement plan and set your account to automatically increase your savings by another percent each year. This small amount is typically won’t affect your finances but will grow over time. Stashing your money in your checking account, family savings account, or worse yet, as cash stored in your home, is not going to give you the funds you need when you retire. When you compare the average return rates for investments with the rate on checking accounts, the difference it could make by the time you retire is significant. Investing in a 401(k) plan is an easy way to start. If you’re wondering when to start retirement savings, the time is now. Because of the way that compound interest works, the earlier you start savings, the less you have to contribute each month. If you wait to start saving at age 35 vs. age 25, you would have to save hundreds more per month to have the same amount in the account by the time you retire. If you would like help figuring out how to start saving for retirement, or would like help creating a financial plan, reach out to skilled financial planner Matt Logan, at www.mattloganinc.com or call 336-540-9700.